Self-pollination or cross-pollination between undomesticated cranberries and selected cultivars occur frequently and produce fruits containing fertile seeds. Seedlings germinating from these seeds are off-type varieties that may have lower fruit yield potential and higher vegetative vigor. Contamination by off-type varieties may result in decreased long-term productivity of planted cranberry beds and loss of profitability for the New Jersey cranberry industry in an increasingly competitive environment. In response to questions from New Jersey growers on the efficacy of preemergence herbicides at controlling off-type cranberry seedlings, we recently conducted an experiment at the Marucci Center for screening currently labeled preemergence herbicides. Seeds were collected from three different varieties (Haines, Mullica Queen, and Stevens), stratified at 3°C for 2 months, and seeded on Petri dishes containing preemergence herbicide mixed in agar. The trial was replicated 5 times and two different runs were conducted during the winter 2018-2019. 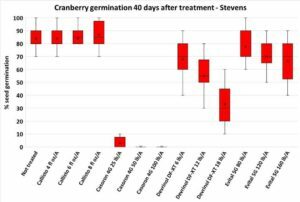 Cranberry seed germination was quantified several times a week and the experiment was terminated by 40 days after seeding cranberry seeds. Results: Callisto, regardless of rate applied, did not provide any control of cranberry seed germination compared to the untreated check. Similarly, Evital 5G did not reduce seedling emergence more than 17% when used at the highest labeled rate (160 lb/A). Devrinol DF-XT had higher activity, reducing seed germination by 30% at 12 lb/A and by 50% at 18 lb/A. However, only the 12 lb/A rate is labeled for sandy beds. Casoron 4G was the most effective treatment with complete inhibition of cranberry seed germination at 50 or 100 lb/A. Similar results were noted by Dr. Jed Colqhoun in Wisconsin on cranberry grown on peat plugs for Casoron and Callisto. However, Devrinol was noted having no activity on cranberry seed germination in the WI study. This might be caused by organic matter binding of the herbicide in peat plug, which is less of a problem in agar. The study will be continued this summer by looking at germination of seed grown in a mix of sand and peat moss and treated with some of the preemergence herbicides mentioned here. These results highlight the need for rotating preemergence herbicide with different modes of action, not only for preventing the onset of herbicide resistant weed species, but also for expanding the spectrum of weeds controlled by these herbicides, including off-type cranberry seedlings.